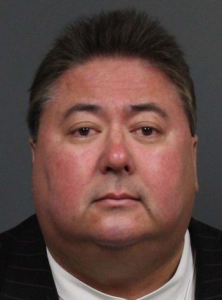 SAN JOSE — Identified by his DNA found on a postage stamp, former Santa Clara County Supervisor George Shirakawa Jr. has been charged with impersonating someone else’s campaign on a fictional and defamatory political flyer. The flyer was created to look as though it came from a San Jose City Council candidate touting an affiliation to the communist regime of Vietnam. In the newly filed complaint, the Santa Clara County District Attorney’s Office charged Shirakawa, 51, of San Jose with a violation of Penal Code Section 529, for falsely personating the campaign committee of Magdalena Carrasco, who was running for the District 5 San Jose City Council seat in 2010. Shirakawa was identified as the perpetrator of the 2010 flyer when a recent routine DNA database search found his DNA profile consistent with the DNA profile found on a postage stamp on one of the 2010 flyers. Shirakawa’s DNA sample was taken at the time of his recent arrest, as required by law, and forwarded to a state laboratory for analysis and inclusion in the centralized state DNA database. On April 22, 2013, the District Attorney’s Office received a Department of Justice notice of the possible match and reopened the investigation into the 2010 flyers. To confirm the database alert, the Santa Clara County Crime Laboratory retested the 2010 evidence and a second DNA sample from Shirakawa. If convicted on the latest charge, Shirakawa faces three years in jail. His arraignment is scheduled for 1:30 p.m. on Friday before Santa Clara County Superior Court Judge Philip Pennypacker. 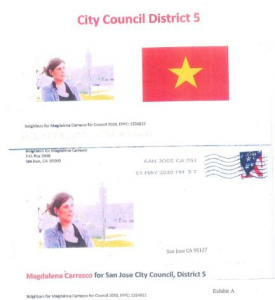 The flyer, purportedly sponsored by “Neighbors for Magdalena Carrasco for Council 2010,” showed a photograph of Carrasco next to a photograph of the flag of Vietnam. Originally the flag of North Vietnam, this flag was adopted by the unified Socialist Republic of Vietnam at the end of the Vietnam War. Consequently, the flag is considered offensive to many members of San Jose’s Vietnamese community, particularly to those who fled to this country to escape the communist regime. Carrasco’s campaign did not authorize the flyers and she never supported or condoned that message. Although the candidate survived the primary, placing second by 20 votes, she lost the general election. A similar flier – also containing an image of the flag of Vietnam – was circulated against a Shirakawa opponent for the Board of Supervisors during a campaign in 2008. That flier included a message in Vietnamese claiming that Human Relations Commissioner Richard Hobbs was a communist. Shirakawa denied any involvement with either flier. In March, the District Attorney’s Office charged Shirakawa with five felonies: four counts of perjury and one count of misappropriation of public funds, as well as seven misdemeanors for failing to file accurate campaign reports. The former president of the Board of Supervisors engaged in a persistent pattern of misusing public money and campaign funds for prohibited expenses, including parties, golf outings and gambling. Shirakawa agreed to plead guilty to all counts and hand in his resignation. The District Attorney’s Office was already seeking jail time for the former supervisor when the latest allegation surfaced. Shirakawa, whose late father was a popular city councilman, previously served on the San Jose City Council, the boards of the Eastside Union High School District and the Franklin-McKinley School District, and various local boards and commissions.